Wake up to memories of your favourite Nintendo characters with this fabulous Game Boy alarm clock! It plays the official Super Mario Land theme tune when the alarm sounds, offering pure nostalgia for lovers of the franchise. Every Nintendo 64 player should remember hunting down these creatures in the world of Banjo Kazooie! Now you can have one or more in real life!! Each of these Jinjo plushies are lost and want to come to a nice loving home. Always come equipped with the right tool to get wasted at Hylian parties with this novelty bottle opener ring. Zelda fans and avid princess rescuers can now effortlessly open their favorite brew of Hylian beer with the flick of a finger. 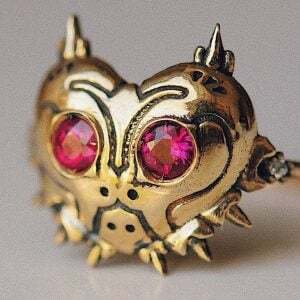 Wreak havoc amongst other geeky jewelry collectors with this gorgeous Majora’s Mask ring! Made from 14k, this custom made piece is inspired by the Zelda series, utilizing two 3mm rubies as eyes along with 1mm diamonds on the side.